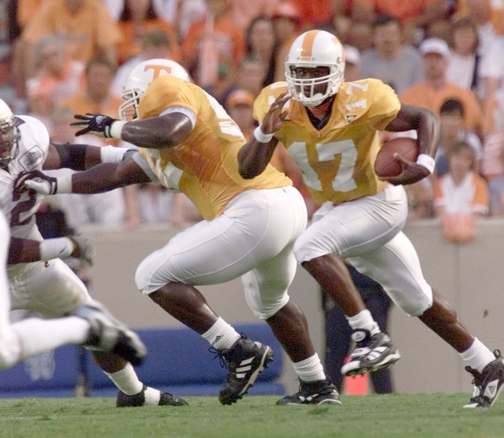 Tee Martin leading the Vols in 1998. Based on preseason predictions, the SEC East is pretty much a toss-up between Georgia and Florida. My question: Why not Tennessee? Granted, the Vols must identify a quarterback. And establish a featured running back. And find more than one playmaker at wide receiver. And fix a defense that was embarrassingly porous late last season. But all of those things can be done, which would set up UT to make a run in the SEC East. It’s not like Georgia and Florida don’t have questions of their own. On top of that, we’re not talking about the Western Division here. From the outside looking in, it’s fair to say the best team in the SEC East would rank no better than fourth in the SEC West. Alabama is loaded, as usual, and then you have Auburn and LSU fighting it out for second. You can make a case that Texas A&M is better than anyone in the Eastern Division. Last season, Florida lost two conference games but still won the division by two games. And the Gators weren’t all that good. Instead of parity, the division was marked by mediocrity. It’s really not that different this time around. If you go game by game through Tennessee’s schedule, you come up with a record anywhere from 10-2 to 6-6, depending on your level of optimism. Can UT get a split of early-season games with Florida and Georgia? Alabama has won 10 consecutive games against the Vols, and I can’t see that trend changing this year. Beyond that, it’s tricky. The Vols are a slight favorite in the opener against Georgia Tech in a non-conference game, but it’s no sure thing. Recent trips to Kentucky and Missouri have proven difficult. LSU rotates onto the schedule this season. And don’t forget that Vanderbilt has won three of its last five games with the Vols. With that said, it’s silly to project the outcome of 12 games before the football is on the tee for the opener. So much depends on injuries. Stars can emerge, and others might fail to play up to expectations. There are just too many variables. One of the things the Vols have going against them is their schedule. Their crossover opponents from the SEC West are Alabama and LSU. In contrast, Georgia gets a bit of a break with games against Auburn and Mississippi State. Florida faces Texas A&M and LSU. Anytime you can avoid Alabama, it’s a plus. Historically, some of UT’s better seasons have come when relatively little was expected. The classic example is 1998, the year after Peyton Manning graduated. Nobody really knew what to expect. And UT won the national championship. Let’s be clear: I’m not predicting a national championship for the Vols in 2017. But it doesn’t take a major leap of faith to believe UT can contend in the Eastern Division. The Vols appear more comfortable in the role of underdog this season as opposed to their status as favorite last year. The 2016 Vols underachieved. Yes, there were injuries, especially on defense, but that’s no excuse for losing to South Carolina and Vanderbilt. Those losses negated earlier victories over Florida and Georgia. Maybe we should’ve seen it coming. It had been years since much was expected of the UT program. The Vols had not contended for the SEC East title in almost a decade. Suddenly, after a nine-win season in 2015, expectations were elevated. No one on the team had been through that level of anticipation before. And it showed. The Vols were out of their comfort zone. The ’16 Vols had a fair share of star power but came up woefully short elsewhere. They did not play like a team with a shared purpose. Two examples: Jalen Hurd and Jonathan Kongbo. Hurd was within striking distance of becoming UT’s all-time leading rusher when he abruptly quit the team at midseason. Even before his departure, there was talk that he did not get along with his teammates or the coaching staff. We’ll never know what that did to team morale. As for Kongbo, he balked when the coaching staff wanted to move him from defensive end to tackle due to a wave of injuries at the position. Kongbo didn’t want to take one for the team. This is where Vols coach Butch Jones needs to step up. It’s one thing to tell prospects everything they want to hear during the recruiting process. Jones is good at that. But once the players get on campus, they need to check their egos at the door. If a player puts his personal goals and feelings ahead of the team, he should be told to relocate immediately. That’s my biggest criticism of Jones. He needs to get tougher with his assistant coaches and with his players. The sooner he does that, the better. Maybe Jones’ offseason overhaul of his coaching staff will pay dividends. Of the five new full-time assistants on staff, the one to watch is quarterback coach Mike Canales. Jones previously had been reluctant to hire a quarterback coach but acquiesced after last season. Perhaps he realized that Joshua Dobbs might have developed into a better passer if he had been personally tutored by a quarterback coach. In terms of the roster, this is the season when we will find out if Jones and his staff have identified talent correctly and developed it responsibly. Unlike last year, the Vols lack star power. Case in point: At SEC Media Days, only four Vols players were named to the preseason All-SEC team, which included a total of 78 positions, including special teams. The only Vols listed were offensive lineman Jashon Robertson (second team), wide receiver Jauan Jennings (second team), return specialist Evan Berry (second team) and punter Trevor Daniel (third team). Compare that to Alabama, which had 14 players listed, including 10 first-teamers. The key for these Vols is in their depth. As injuries mounted last season, we quickly saw that backups were not capable of playing top-tier football when pressed into action. Jones says he believes that is no longer the case, thanks to the sophomore and freshman classes. In many ways, those two classes will determine how far the Vols can go in 2017. And in a jumbled SEC East, the goal should be the division championship.